Lafuma Mobilier joins you on your balcony for a meal! Yes, really! The company lends its long outdoor experience to offer a collection specially designed to transform your balcony into a luxury retreat for mealtime. Stylish, ultra-practical, sturdy and space-saving, the Anytime range will suit the family lunch, friendly drinks with the neighbours or a candlelit dinner for two. Clever and colouful, it fits in with any surroundings from the "pocket-handkerchief" city balcony to the expanse of a penthouse terrace. The table is very functional with a resistant tabletop and safe base. It can also be infinitely personalised with coloured corner protectors. The chair is compact, light and comfortable. The clever folding mechanism is very practical as they are both set up and stored instantly. Don't wait any longer to imagine how your decor could look, just as you like it. Personalising your exterior space is child's play. 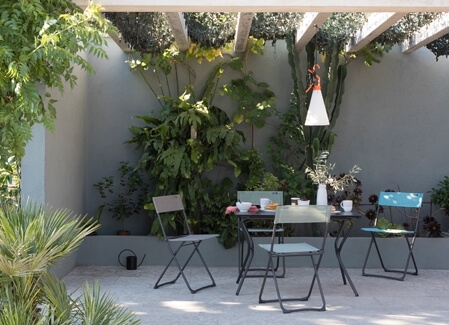 Try acid tones to pep up the little outdoor space or emphasize a more neutral palette to create a zen ambiance.... And enjoy this innovative and desirable collection to the fullest!